The Honorary title of “Minor Basilica” is granted by the Holy See (Vatican) to certain churches outside Rome because of their historical and architectural value as well as their contributions to the community. Basilicas are expected to be centers of worship that are recognized through the diocese. They are to promote the teaching of the Holy See and the Holy Father, to provide liturgical formation, to be exemplary centers of worship, especially in regards to sacred music, and to make ample provisions for the celebration of Sacraments and various approved devotions. What are the responsibilities of a Basilica? Bestowing the title “Basilica” on a church establishes a particular bond with the Holy Father. Therefore, Basilicas have the responsibility to promote the study of the documents of the Holy Father and the Holy See, especially those concerning the Sacred Liturgy. Also, certain days in the liturgical year are to be celebrated with added solemnity. The feast of the Chair of Saint Peter (February 22), the Solemnity of the Apostles Saint Peter and Saint Paul (June 29) and the anniversary of the election or installation of the Pope. What is the difference between Major and Minor? There are nine major basilicas, seven of which are in Rome: The Lateran Basilica of Saint John (The Cathedral Church of Rome and “First and Mother Church of all Churches” from which all basilicas take their name), the Vatican Basilica of Saint Peter, Saint Mary Major, Saint Paul-Outside-the-Walls, Saint Lawrence-Outside-the-Walls, Saint Sebastian and the Basilica of the Holy Cross (built by the Mother of Constantine over soil brought from Jerusalem and which enshrines the instruments of the Passion of the Lord Jesus). The Basilica of St. Francis in Assisi and the Basilica of the Holy Sepulchre in Jerusalem are also designated as Major Basilicas. Of the major basilicas, four share the title Patriarchal basilicas, being the original and of which there is a Papal Throne (The Lateran Basilica, The Vatican Basilica, Saint Paul Outside-the-Walls and Saint Mary Major). All other basilicas are minor and there are approximately 73 minor basilicas in the United States. The Basilica of Saint John the Baptist is the only basilica in the Diocese of Youngstown. Considered the pope’s church, the title Basilica carries with it both privileges and obligations. Among the many primary privileges are the right to display, both inside and outside, the coat of arms of the pope who designated the church as a basilica, and the display of the Basilica’s own coat of arms, bearing the marks of the principal arms of the Lateran Basilica in Rome, the Cathedral Church of the Pope. 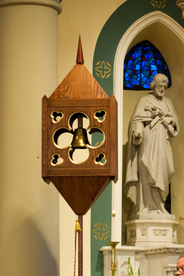 In addition, two additional symbols rooted in the papal court, the tintinnabulum and the ombrellino are proper to the church for use and display. The tintinnabulum is a bell which had the practical function of alerting the people to the approach of the Holy Father during papal processions through the streets of Rome. The ombrellino is an elaborate umbrella which would protect the Holy Father from inclement weather. 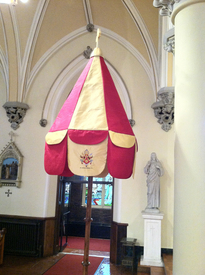 The panels of the ombrellino are made of alternating red and yellow silk fabric (the papal colors). It is always displayed half-way open to signify that the church is ready to welcome the Holy Father! These two symbols are to be displayed in the sanctuary on a permanent basis. How did this honor come about? Four years ago, our Bishop, the Most Reverend George V. Murry, SJ, asked each parish in the Diocese of Youngstown to think outside the box in regards to its viability to the community, city, county and diocese. The question of applying for basilica status had been on the table several times. Once we examined the criteria for being elevated to a minor basilica, we realized we met each condition, and with Bishop Murry’s approval and blessing, we made application through the Diocese of Youngstown, The United States Conference of Catholic Bishops and the Holy See. The original application was in Latin and had to be translated into English. A document containing six pages of questions became a testament to our parish of over fifty plus pages. We had a local historian offer some insight into our past, we hired (through the generosity of a parishioner) a professional photographer to thoroughly document our beautiful church building both inside and out, and we spent months finishing the basilica application. The process took three years to gain approval. Who served on the Basilica Committee? Very Reverend Ronald M. Klingler, Mr. George Mangus, Mr. David Kaminski, Mrs. Lurene Reed Gasser, Mrs. Kimberly Musille and Mr. Robert Sullivan. This committee was formed as part of the parish audit process instigated by the diocese, and evolved into the Basilica Committee. The Elevation Liturgy took place on Sunday, November 25, 2012, Christ the King Sunday.